It’s a welcome return to the Liverpool stage for Oxford rockers Glass Animals this week, Getintothis’ Emma Walsh catches up with drummer Joe Seaward ahead of their date at Magnet this Friday. This week sees Oxford’s Glass Animals return to Liverpool following their successful outing at Sound City earlier this year. And a busy year it’s been, the four piece have been touring America off the back of their album release in June, and are set to bring their eccentric mix of indie rock to The Magnet this Friday. When we caught up with drummer Joe Seaward last week the band were in Kansas City and had recently announced their biggest headline show to date at Shepherds Bush Empire next March. Seaward admitted things have all been going so fast since the album came out that they’ve hardly had time to sit back and take it all in, but it seems to be a roller coaster the band are very much enjoying. Their debut album Zaba has had a bit of a mixed reaction but the resounding response from all corners is that this is something quite unlike anything we’ve heard before. 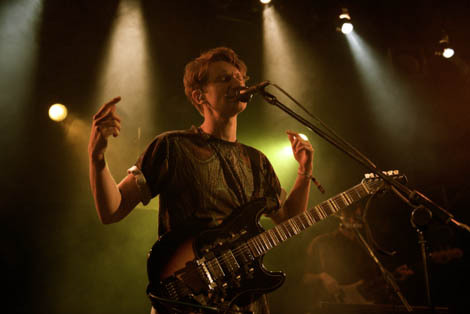 Some critics have called comparisons with Alt-J or their fellow townsmen Radiohead, but Glass Animals are proving to be a band difficult to pigeonhole. And whatever the thought process behind Bayley’s songs, it seems he isn’t always forthcoming about it, even with his bandmates. When asked what was behind some of the bizarre track titles on the album Seaward laughed: “some of them have a meaning to Dave, some songs I don’t actually know what they mean but they are very personal things to me because I’ve been with them since they were born, in a way, so I have very personal connections to the songs without actually knowing what they’re about because Dave never actually tells people, which I think is quite cool”. It’s an interesting idea of how to keep a very tight grasp of something as personal as song lyrics even when they’ve been released into the wider world, particularly with an album such as Zaba which makes you want to dance much more than sit down and contemplate the human condition. You can sing along without really knowing or understanding the lyrics because their titles rarely give you much to go on (Walla Walla, Jdnt, or Toes), but that’s almost the beauty of it, you can just take a feeling or a vibe and go with it like the “tipsy topsy slurs” and “peanut butter vibes” subject in Gooey. That song also mentions a “jungle slang” (which along with the undeniable hip swerving beats draw our minds to Jungle as a credible comparison) which seems to be the source of the odd album title. Zaba, without appearing to mean anything, does perfectly capture the rather exotic or eccentric sound of the album. As Seaward explains: “there isn’t a right way of saying it, you kind of make of it what you will, it’s not like knowing an album is about love because its got love in the title, you can make of it what you want and pronounce it the way you like, it can mean something more personal to you if you don’t know why it’s called what it’s called – it can be if you want it to be, and if you don’t want it to be just call it Zaba and accept that its a strange word”. It’s an oddly clever way of encapsulating the essence of an album, but rest assured not quite so much thought went into all of the tracks on the album as Seaward admitted: “There’s a song on the album called Wyrd which is quite a weird song, called so because it is weird, spelt in a weird way, again because it’s weird, and lots of people don’t call it weird, they pronounce it ‘wired’”. Whether you can find any deep personal connection with their tracks or not, we can assure you that Glass Animals will make you throw some moves at The Magnet this Friday.